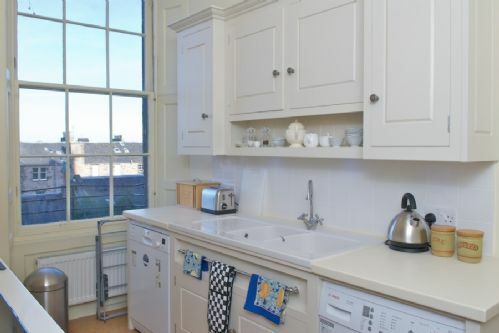 Spacious traditional two bedroom apartment built around 1804, with 1 double & 1 single bedroom, spacious living room & kitchen, located on Heriot Row. Great views looking down over the New Town and into Queen Street Gardens within easy walking distance of Princes Street and the Royal Mile. We came to Scotland to celebrate my husband's 60th birthday in style and the Heriot Row apartment helped to continue the theme of comfort and luxury. The apartment had a good vibe and was well placed for all the important areas that we wanted to visit. 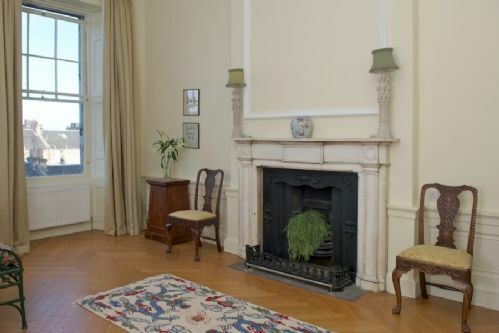 This is an elegant Regency apartment still with many of its original features and furnished in an appropriate style. Despite its elegance and grandeur it is also very comfortable and feels like a home. There are lovely little touches which made us feel immediately welcome. We spent Christmas here and it was the perfect setting for a traditional celebration. The location is excellent for exploring the side of Edinburgh away from the bustle of the Royal Mile. This was my second stay in this apartment and I'm already planning a third visit. I would recommend it to anyone wanting to enjoy Edinburgh at its best. Loved it. Beautiful apartment. Perfect location. Only suggestion is to install working lights in the entry hall and stairway. 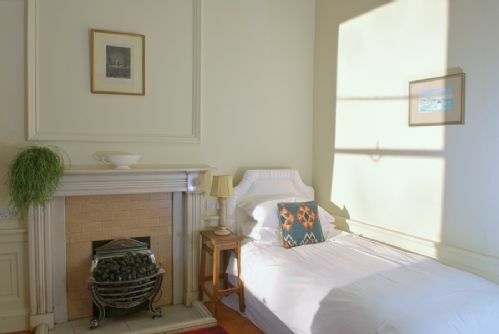 As a regular Festival-goer, this apartment was just the job for our week’s stay in Edinburgh. Good location a few minutes from Princess Street, but quiet and peaceful. The rooms are spacious and comfortable. Customer service was good. Fantastic location in New Town. Short walk to all central locations and Stockbridge. Huge airy rooms and great to have access to the gardens opposite. NB the flat's up a long flight of stairs and there isn't a bath. 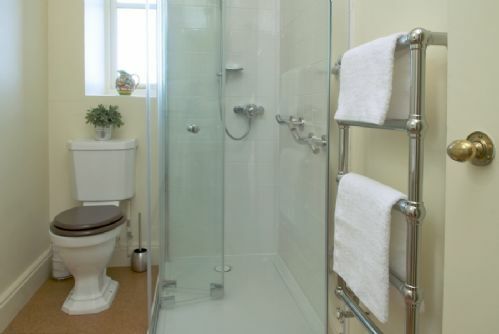 Good and clean appartement for a family of three to explore Edinburgh. Very close to the heard of the city. This was a great apartment in a great location. It totally exceeded our expectations and I would recommend this apartment with confidence. The apartment was clean, well kept, in a very quiet area. It is a 15' pleasant walk from the city center. The building is very elegant, the only thing that was not so good is the main building entrance, definitely not up to apartment. Really great location close to all major attractions, yet on a quiet street. Lovely apartment with lots of space and nice period features. We very much enjoyed a return visit to this unique flat. Huge lofty Georgian rooms furnished with tasteful period furniture and access to the private gardens opposite make it a very special place to stay. A small plumbing problem was dealt with quickly and efficiently. We will most definitely return! Beautiful apartment on a lovely street. The rooms were huge and the apartment was so lovely and warm and spotlessly clean. The kitchen was great and contained everything we needed. Lovely living room and we really made ourselves at home. This was a great base and we really really enjoyed our stay ! The greatbase team were fantastic to deal with, the property at Herriot Row is a typical town house style property you find in Edinburgh. Beautiful property and very comfortable, will defiantly stay here again and would recommend this property to anyone looking for a short stay. Really lovely 2 br apartment. Great, small kitchen. V'y large main bed room and cute smaller bedroom. Lovely views. Big lounge. Very quiet - serene even. Only complaints: no coat rack or hooks for coats, hats, etc. and expected to take out garbage on short stay (can understand for longer stays). Would stay here again without hesitation. Lovely place, street and of course city. Absolutely adored Herriot Row. Magnificent apartment, awesome position to everything and the private gardens were Devine! We are planning a return trip to Edinburgh and will hopefully stay at Herriot Row again. Our accommodation was really nice and spacious and in a great location for the city centre. Even though we were only five or ten minutes' walk from all the main sites (except for Arthur's Seat! ), the location was very quiet and with an attractive communal garden area across the street. We had a great time in Edinburgh and would happily stay in this apartment again. It was so spacious and clean. Beautiful neighborhood and so clean. It was close to everything we wanted to see and close to restaurants, tea rooms, pubs and shopping. We will definitely book this apartment next time we are in Edinburgh. We felt so at home at it was clean and well kept. Only thing was not enough glasses and no light in the stairs to our apartment. Other than that, relaying beds, spacious rooms and lovely living room and kitchen. We had a great stay! We stayed at Heriot Row during the Edinburgh Festival and thoroughly enjoyed everything, from our welcome from Katie, to the great accommodation. The apartment was spotlessly clean, very comfortable and in a fantastic location. Having access to Queen Street Gardens was the icing on the cake. Thanks Greatbase for a straight forward booking and a 'Great Stay'. We loved it. Very spacious, very clean, fantastic location and very quiet. Super host, who met us and did not complain when we were delayed. It will not be the cheapest apartment in Edinburgh but, given its location and size, I consider it good value for money. The TV reception was not good due to the indoor aerial but it did not particularly bother us - maybe a system which allowed access to iPlayer and similar via the internet would be a good idea? The internet seemed to be quite fast and generally worked very well during our stay. Having stayed in a number of apartments in Edinburgh over the years this one was the best so far. This apartment outdid all expectations. It is absolutely beautiful, very clean and comfortable, and the eclectic collection of books was an added delight. Three nights there wasn't enough and I hope to return regularly and for longer to explore this part of Edinburgh. Great location and very peaceful even during the Fringe Festival. access to Queen Gardens was a bonus. We were impressed by the apartment's spaciousness and by the way the living room and both bedrooms were set up. The atmosphere of the apartment was great, books on shelves included many interesting titles, and the fact that we could have the key to the gardens across the street made our experience even more enjoyable and special! Things that could be improved include providing more pots and pans in the kitchen, kitchen towels, etc. Kate was very nice , apartment is hugh and very decorative, everything is clean except the pillows smell strange, no tumble dryer but the clothes horse has broken, kitchen excellent. 10/2 Heriot Row was the ideal accommodation for our trip; it was in a great location for walking to everything; was one of the few reasonably priced flats with two bedrooms; and gave us a true UK living experience with it's historic architecture and numerous neighbourhood pubs and shops. The flat was clean and quite well stocked = could have used a few more tea towels and the freezer is in definite need of a defrosting and a few more ice cube trays - but those were very minor things. Katie was very helpful with information about transportation, tours and shopping. And she provided a few of the basics like milk and some fruit to get us going. Wonderful apartment in a great area to walk to restaurants, groceries, sightseeing. Katie was just terrific to meet us and leave us apples, milk, and beautiful fresh tulips!! A very comfortable stay with all that we needed as a base to explore Edinburgh. Katie and Callum at Greatbase were very helpful and it was good to know they were easily contactable if needed. We ha da wonderful time in Edinburgh, the apartment is only a few meters from the centre. We felt like at home . . . This is a lovely place. Great location and comfortable, spacious apartment. When it's just the two of us visiting Edinburgh, we always check this one first. We loved everything about our short stay in this flat. Originally part of a Georgian town house, the flat has retained much of its original elegance. 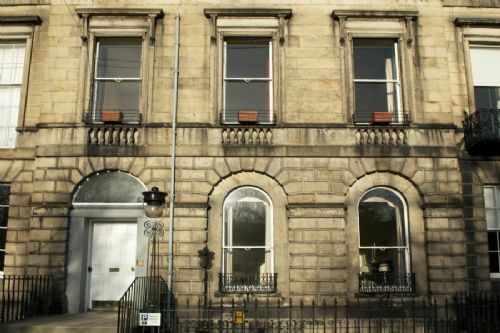 Mounting a few steps from prestigious Herriot Row, through a spacious communal entrance hall, we climbed the curving stone steps to the flat, which was spacious, comfortably furnished and filled with light from huge south facing windows which overlooked Queen Street Gardens. To my delight we were given a key to these beautifully cared for private gardens, normally the preserve of New Town residents only. The bedroom on the north side was of similar proportions to the lounge, with an intriguing hidden wardrobe, and also filled with light from its two Georgian windows which looked out on the pretty mews houses, once the stabling for the main house. The kitchen and bathroom were both, in relation to the other rooms, small modern and functional, but perfect for our needs. There is a convenient metro supermarket round the corner, opposite Leo's Beanery which does great breakfasts. We would love to return to this flat! This was a very spacious apartment in a great location for a short break. Everything within walking distance but if you want free parking its quite a way away and the traffic wardens are there on the dot to catch you! We enjoyed the christmas markets and the galleries and walks along the Waters of Leith, all within easy reach. Enjoyed our stay in Herriot row ,well located for visiting all the sites. Apartment was very clean, well heated and very spacious. Upon arriving we met Katie who showed us around the apartment and gave us some fab suggestions on which restaurants to try and which attractions to visit. I particularly enjoyed the whisky tasting at the Whisky Society which is just the other side of the park on Queen street. We ate at Tom Kitchin's restaurant, Kitchin, which is an amazing fine dine experience! We also ate at his pub, The Scran and Scallie, which is in Stockbridge and walkable (20 mins) from Heriot Row. The apartment itself is beautiful. Very clean and spacious with some really lovely Georgian features. The living room is huge with a big sofa to relax on at the end of a busy day walking around town. I mention the sofa because you don't actually see it in any of the photos so we had to phone and ask before booking. Perfect location in New Town and a very short walk to the main shops, pubs and restaurants on George Street. If you like whisky, you must try the Amber bar at the top of the Royal Mile (old town) which is inside the Scotch Whisky Experience building. I won't bother with the tour, just go and sit at the tasting bar and tell the barman what you like and they'll sort you out with a 'flight' - 4 whisky's to taste. Also, go for a drink at the Dome on George Street. It's wonderfully decorated at this time of year and really gets you in the Christmas spirit. Getting to the apartment from the airport is sooooo easy. Just get the airport express bus (100) from right outside the arrivals door and get off at the Princess Street stop and walk up Hanover Street and down to Heriot Row. We had a wonderful time and will certainly return! We had a lovely time in Heriot Row. A beautiful flat, in an extremely quiet location, yet only 5 minutes walk or so from the centre of the city. Stayed in the Heriot Row apartment during the first week of October. The apartment was much bigger than it appears in the photos and was light, airy, warm and full of character. Even though it is not far from Princes Street we could not believe how quiet it was (especially at night). Although a very short walk to Princes Street there was both a small Sainsburys and Tesco Express which were even closer. The kitchen had all the necessary crockery and pots and pans etc to make a meal. Lots of tourist information provided at the flat. Nearly everything was within walking distance (some very tired feet) and for those attractions not close by it was easy to catch a bus from Princes Street to, for example, the Zoo, or the hop-on hop-off tourist bus on Waverley Bridge. Very pleased with the service provided by Greatbase - always quick to answer my emails. Thanks to Katie and her team. We stayed for about 2 weeks at 10 Heriot Row in August. It was a very pleasant stay, close to the heart of the city but still a quiet zone. Katie was very helpful with all of our needs as always. Would gladly repeat the experience. the service is very poor. i am dissapointed about the behavior of the service people. We helped Mr Wang and his family select the right apartments for his stay in Edinburgh. His wife and child told us that they enjoyed their time in our Albany Lane and Heriot Row apartments. As with all our guests, we notified Mr Wang of the departure time both prior to his stay and upon his arrival via email and verbal communication respectively. On the morning of his check-out date, Mr Wang left his wife and child at the apartment to attend a meeting in town. We arrived 2 hours after check-out time, to collect laundry and to clean the apartment for the next guests who were due in a couple of hours. Mr Wang's family were still using the apartment so we help them collect their belongings and carry their suitcases downstairs, as well as to book a taxi to take them to where Mr Wang had his meeting. A member of staff also accompanied them to be of further assistance in their journey. Mr Wang felt our service was not flexible enough and that he should be entitled to leave his luggage and family past departure time until he was ready to fly home later that afternoon, which would have been after our new guests arrived. Spacious apartment in lovely quiet road very near the centre of things. Huge sitting room, lovely kitchen and masses of old world charm. Mattresses a little old so got backache, but otherwise spotless. 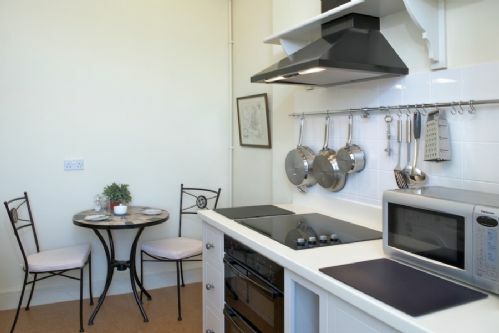 Lovely, spacious apartment with modernized kitchen. Great Location! This lovely 2 bedroom apartment, or flat as you all say, was perfectly located in a quiet neighborhood just moments walking away from everything. It has a modernized kitchen and huge living room, with plenty of charm. Excellent flat in great location. Yes some things could have been 'better' but then you would be paying a lot more money for the same stay. 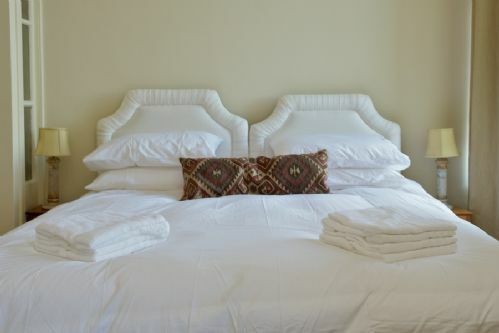 As it is the flat offers great value for money - comfortable, clean and with friendly and helpful check in. If you want to eat at home the kitchen is well equipped - if you want to eat out it's all on your doorstep. Thoroughly recommend the flat and we plan to return. This place was the cleanest and nicest place i have ever stayed in on holiday . Katie advised me this place would be suitable and she was right . The location and everything about it was perfect . First time in Scotland, travelling with our daughter. Edinburgh is a very charming city, for its authenticity I would compare to Siena, Florence or even Venice (and I'm italian!). 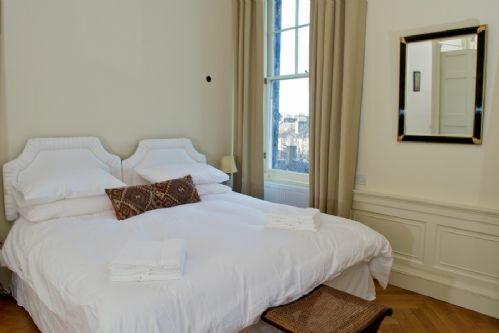 The flat We stayed in at Heriot Row is simply wonderful, a true victorian building, a huge space and all comforts with class, just ten minutes walk from the Royal Mile in a quiet area perfectly served. We said We must get back to Edinburgh to see more or just to live such a nice atmosphere of an art city and really We would like to be back at Heriot Row if possible. Very good experience! From the moment we stepped into the flat (the photos do not do it justice! ), we felt special. Very spacious, very well equipped and comfortable. We need not have taken so much stuff as cupboards had selection of washing liquid, softener, dishwasher tablets etc. You never quite know what to take. The Sainsburys local, just round the corner kept us fed and watered and the city is literally a 5 minute walk. The only recommendations we would make is that some dishcloths would be good and some drinks coasters. We were a bit worried about marking the lovely furniture so ended up using some of the leaflets. Very, very minor points and in no way took anything away from what was a really fabulous week. Would have no hesitation in recommending this break to anybody else or coming back ourselves. A very spacious and comfortable apartment in a prime location. Lovely rooms with private gardens over the road made our stay quite special and a real treat. This was a great place to stay. Perfect location for Waverley station, Stockbridge bars and restaurants and all the amenities off George Street. It was very comfortable and well equipped and access to the Queen Street gardens was a bonus.Katie was welcoming and helpful. Nothing but good things to say about Greatbase and the property. Also really good value when compared with the price of a hotel. Heriot Row is an ideal location for sightseeing in Edinburgh. We walked to Edinburgh Castle, Waverly Train station, Princes Street and many neighbourhood shops and restaurants. The apartment is very well appointed and very spacious. We loved everything about it! Great location and beautiful flat. Close to all attractions and a historical site in the same building row. Very quiet for such a convenient location. Great place to discover Edinburgh in arguably Edinburgh's finest street. My fiancée and I enjoyed a great short break with Great Apartments in a wonderful Georgian townhouse apartment. The largest rooms (lounge and main bedroom) were huge and tastefully decorated. We also enjoyed the access to the private Queens Gardens which have a reclusive feel in the heart of Edinburgh. 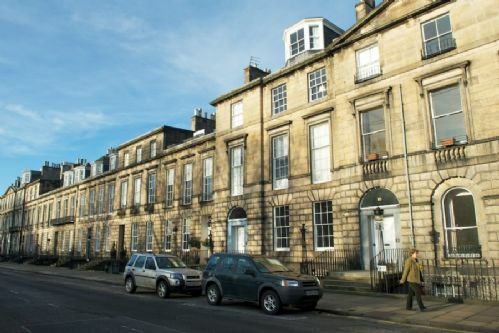 Heriot Row is a brilliant location - handily placed for local restaurants, places to visit (a short walk to the National Portrait Gallery), the city centre itself and Stockbridge is just round the corner - more food, weekend market and very nice shops. The booking was easy and we were met at the flat at the agreed time - Katie was very friendly and helpful. We would love to stay here again. 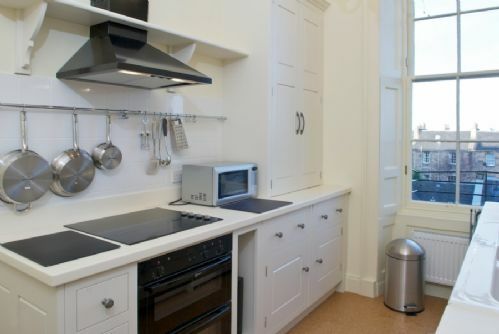 We were visiting Edinburgh for Hogmanay and were lucky enough to find this wonderful apartment. It is absolutely beautiful with a fully equipped kitchen, bathroom, large living room/dining room and 2 bedrooms (one of which has 2 beds). It is perfectly located on a quiet street minutes away from all the action (which was great for getting to and back from hogmanay events). The letter is wonderful to work with as well, promptly answering any and all questions we had both before and during our stay. I would recommend this apartment to anyone staying in Edinburgh. 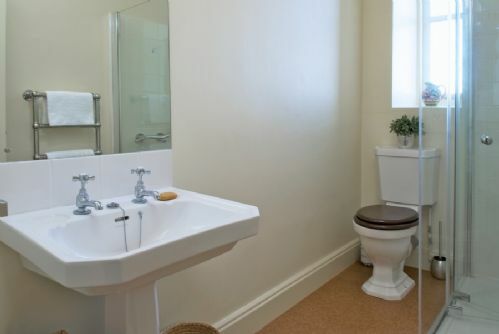 This is a really lovely flat - beautiful, clean, comfortable and well located. Greatbase was recommended by a friend and we will certainly use this company again. The apartment was well located and exceptionally spacious. We felt that a few additional items of kitchen equipment would have been useful, such as more pans and cooking utensils, plus proper drinking mugs. However everything else was very good indeed. Das Apartment liegt sehr zentral in der "Neustadt" von Edinburgh. Es ist sehr groß und schön eingerichtet. Die Küche enthält alles, was man benötigt. Parken ist sehr teuer - man kann das Auto jedoch einen angenehmen Fußweg weit weg kostenlos parken. Kleine Supermärkte zur Selbstversorgung gibt es in der nächsten Seitenstrasse. Edinburgh sollte man "erlaufen" oder mit Bus & Bahn "erfahren". Man sollte auf jeden Fall auch Tagesausflüge in die Highlands unternehmen. Comfortable stay in large apartment, gardens nice, near to centre,eateries close by. Kitchen crockery rather eclectic, single bed matress needs repalcing. Such an amazing apartment. It is a real diamond in a wonderful location. Well priced for during the festival. Will stay here again.Our home away from home. we spent two weeks at Heriot Row and we really enjoyed our stay in that spacious apartment. It is well furnished with all needed appliances and the furniture is very stylish: armchairs are so comfortable that you can't but fall asleep quite fast! The location is superb, right in the heart of New Town and close to Old Town as well. We could even watch the Festival Castle Fireworks from the living room windows! The street is very silent and the private Queen Gardens are just in front of the house. We would go back there should we return to Edinburgh! We loved our stay at Heriot Row. 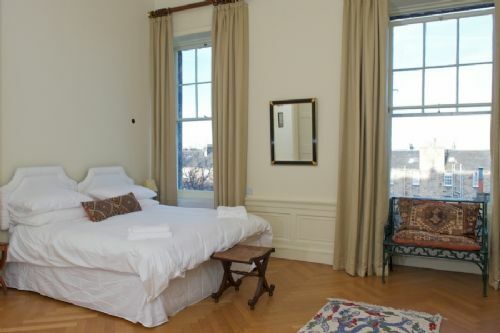 The apartment is just right with all the home comforts and retains lots of period detail. The location is ideal for sightseeing and shopping in Edinburgh. Its just a short walk to wherever you want to go and in a great area with lots of literary associations good pubs and cafes. Greatbase are fantastic to deal with online and when you arrive they give you a really friendly welcome making you feel at home straight away. Thank you Katie and Greatbase. Michael & Frances from Australia. Big, airy rooms, tastefully furnished. Quiet and peaceful with use of gardens opposite and in excellent location. Easy to get to both Princes St and Stockbridge. Now, we know better Edinburgh, we think New Town is the best area for living in Edinburgh. Thank you very much also for your advices and care. We hope coming back soon. A charming, graceful and surprisingly peaceful flat. It looks even nicer than in the photographs and has a great feel to it. It was slightly (I mean, slightly), let down by some of the fittings and furnishings: for example, the garden furniture supplied for the kitchen was for two but the flat is rented for three people. It might be better to edit some of the antique chairs (and a quirky iron bench garden bench in the master bedroom) and swop these for additional tables/ desks. The round table in the sitting room is more like a card table than a sturdy dining table. Both bedrooms are spacious enough and would benefit from a small desk/table suitable for writing or using a laptop. Some of the numerous very small bowls/soup plates could be replaced with normal flat dinner plates and a few kitchen utensils which appear to have been overlooked e.g. a tin opener or something to use when cooking with non-stick pans. The flat has pretty good storage, even a potential coat cupboard in the internal hall, but there is still quite a lot of housekeeping, DIY, old furniture and general stuff filling up some of this space. A quick tidy up and despatch would solve this. With a few, small, inexpensive tweaks the comfort and flexibility of the flat would be greatly improved. There really is much to admire: high ceilings, central location and access to the delightful private gardens across the street. The kitchen was pleasant and modern. The bathroom had been refreshed with a separate shower. The master bedroom is huge and backs onto pretty residential gardens. The bed was very comfortable. The second bedroom was larger than I expected. The sofa in the sitting-room was very comfortable. During our stay the television was upgraded, by chance, to a slighter larger model. The WiFi works very well in most of the flat. Katie from Greatbase was pleasant, helpful and provided good local knowledge. Her tip to visit the local farmers' market in nearby Stockbridge was spot-on and as a result my son and I enjoyed a tasty outdoor lunch the next day. Although, I was not initially delighted with the potential extra charges for arriving earlier than 4pm which I didn't discover until I had booked (perhaps I missed it on the website), I suppose on reflection this is just another, tighter business model in the style of Travelodge or Easyjet. Booking was easy, quick and, Katie, replied to my email query quickly. Did my family and I enjoy are our stay? Definitely, yes. Did we want to stay longer? Yes. Would we return? Yes. Heriot Row is a great location to explore Edinburgh and this accommodation gives a real taste of Georgian grandeur with all of today's modern comforts. The booking and service from Greatbase was very straight forward and Katie is very helpful and welcoming. We thoroughly enjoyed our stay at this beautiful apartment. It was exquisitely furnished, unbelievably spacious, warm, comfortable, perfectly located and more than provided for our every need over Hogmanay, we could easily prepare and cook our three course dinner on New Year's Day. We had a really relaxing time and would not hesitate to stay at this apartment on our next visit. Katie at Greatbase was not only very helpful, particularly when our heating failed on New Year's Eve, but also extremely knowledgable about the history of the area and Edinburgh in general. Very impressed. My friend and I have just had a fabulous week in Edinburgh staying at Heriot Row. It was a great Georgian apartment, exactly how I imagined Edinburgh. The apartment was very spacious and comfortable. It's location was amazing, within walking distance of everything, and if too tired to climb up to the Royal Mile a bus stop just round the corner with a really good regular service. I do have few points that, for me, could do with addressing. Please note that these are NOT criticisms but merely suggestions and some personal preferences. 1. The lounge - The cleaner needs to ensure they check under the sofa cushions because (having dropped my opened purse and having to find all the loose change, I found some crisps and quite a lot of old dust underneath the cushion seats. Having said that everywhere else was spotless so perhaps this just go overlooked. 2. TV - I found the TV was somewhat too small for the lounge and we did have a few nights in when we would just have liked to watch a DVD, the website indicated that all apartments had DVD players, this one does not. 3. Large double deb - I like a firm bed but for me I found this just a little too firm - this is obviously just a preference. 4. Main bedroom again - I would have liked to have a small kneehole dressing table. There is plenty of room for one. Overall however, this was a great apartment and most definitely a superb location. I would definitely recommend it and will certainly use Greatbase again should I return for a week or more's stay in lovely Edinburgh.